Royal Flush asks the question, can a man who throws his dates in a dungeon succeed romantically? A recipient of the H. R. (Bill) Percy Prize, Royal Flush is a novel about a man known only as the King, and as his Kingdom careens toward catastrophe, he cruises seedy taverns looking for likely maidens. He is particularly bad at this. His incompetence and his weakness for beautiful women drag him deeper and deeper into trouble. He is portrayed as a cross dresser by the Kingdom Crier, the Kingdom's most popular tabloid. Shortly after, he must defend his castle against a siege with only his royal fiddler--while attempting to steal his royal fiddler's girlfriend. 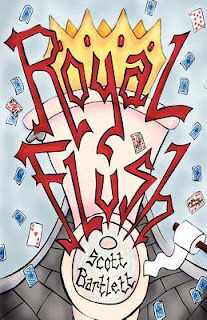 Scott Bartlett dishes up a hand of hilariousness in his novel, Royal Flush. Which, surprisingly, doesn't have a poker game. I was consistently ambushed by the characters, plot, and the overall comedic tone of this novel. And I loved it. The King, also known as Mud the Marauder in later chapters, needs a wife. But he doesn't want one. A few prospects he even tosses in the dungeon, with his mother. A fate that no citizen deserves. The King's a little shy on morality, but has an overabundance of executions. He even manages to fall in love. A few times. Though the women always seem to leave him for someone else. Readers will have an easy time connection with the King based on the hilarity of the novel. How can readers not like someone who has absolutely no ambitions and likes to steal from people to the point in which people want him to steal their belongings? It's chaotic, crazy, and lovely. To say the least. Bartlett crafts the plot in a wide arc of unfortunately funny situations. Often jumping back and forth between the past and present, really giving the reader an entire painting of the King's life. Which another character is writing as the reader is reading. The story line revolves around love and how the King just can't find it. And the problems that occur when he does. Royal Flush is a refreshing and extraordinary novel involving all the duties a King doesn't do. Recommended for anyone who loves to laugh.